2016 was a big year for My Name is Kumar. 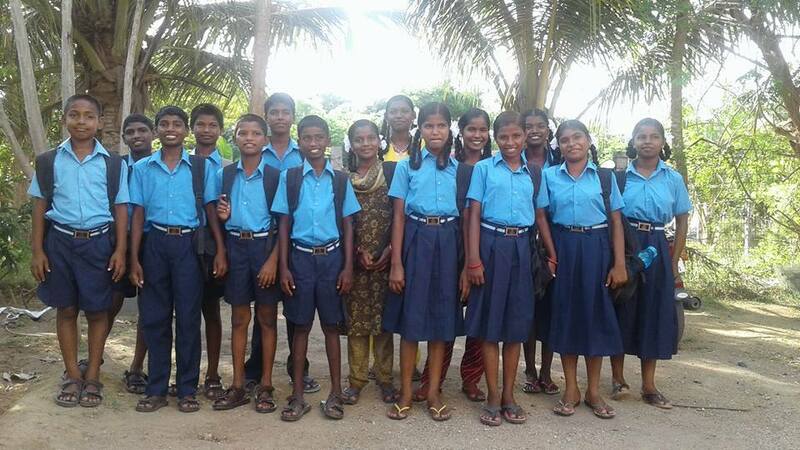 We more than doubled the number of children whose education we support, formally launched our community development projects and went on our first ever trip together outside of Tamil Nadu. It was also the year more of you became involved in our work, with lots of you signing up to become child sponsors and an incredible number of you contributing to our Christmas crowdfunding campaign on Global Giving. What follows is a list of some of our proudest achievement from the last 12 months. Thanks to a partnership with UK charity Salt of the Earth, this year we started supporting the education of an additional 37 children from the Londor community. These kids live at home with their parents and we offer extra help to their mums and dads getting the children ready in the morning and after school with homework. The majority of children in the Londor community did not receive birth certificates when they were born. This means that they don't legally exist – which prevents them from ever being able to find legal work as adults, get a passport for travel or go to university or college. We've made a promise to provide all children from Londor with a birth certificate. In 2016 we completed the process for 41 kids and we aim to keep our promise by mid 2018. To put this into perspective that's over £10,000 a year that will be spent on the education and upbringing of children who would otherwise be begging on the streets of Tamil Nadu. Thank you to everyone who become a child sponsor. We're looking for more of you to provide consistent and sustainable support for our organisation, so if you're interested click below. In the school holidays we took the children for a 6 day holiday in the tea hills of Munnar, Kerala. For all of the children (and even some of our staff) this was their first time outside the state of Tamil Nadu. We will never forget the screams of joy when they first saw the beautiful rolling hills. The children all enjoy a vast array of hobbies, from yoga and swimming to dance and performance. This academic year 18 of our older children were specially asked to join after school activities at their school. This includes basketball, Indian and Western dance, running, volleyball and National Cadet Force. Click the link below to give a one off donation to support more extra curricular activity. Right at the very end of the year we launched a Christmas crowdfunding campaign to kick start our fundraising so that we may build a new home for the children of My Name is Kumar – to drastically improve on the 3 rented houses we currently operate from. We raised $11,000 from 145 of you, and we won $1,800 in additional funding! Thank you to all involved, you can still donate below. Following the devastating floods in the winter of 2015 we set about rebuilding the homes that the Londor community lost. We partnered with Infosys and Mexican organisation Programma VACA to build 16 new, sustainable homes. The community themselves helped plan, design and build these homes – plus a community centre! In May our long term volunteer Karunya travelled to the Netherlands to receive treatment for an accident she had over a decade ago. When she was 13 Karunya lost her leg in a motorbike accident in which her father also died. Ever since she has lived with an uncomfortable and ill-fitting wooden leg. However, thanks to your donations and the generosity of Dutch company Stel Ortopedie, Karunya received a brand new custom-fitted prosthetic limb. In April of 2016, cousins Henry and Dan cycled over 1,400km from Brussels, Belgium to Pamplona, Spain to raise money for My Name is Kumar, in memory of their Grandad, who did the same route evading Nazi capture during WW2. Together they raised over £4,000 for MNiK. We're always interested in hearing your ideas for fundraising – get in touch! During the summer holidays the children were lucky enough to be visited by a skateboard coach who also came with skateboards and trainers to donate. Some of the skateboarding techniques employed may have been unorthodox but a LOT of fun was had! For the 4th year in a row we are happy to report a 0% school dropout rate. This means that all the children who began the year in school with our support, remain in school. A child may dropout of school for many reasons, e.g. child marriage, family relocation. We work with families to prevent this whenever we can. Click the link below to become a child sponsor and support a child through school. Sivaranjani was born with scoliosis, a spinal condition which affects her growth and internal organs. She needs an operation to correct the curvature of her spine. We found a top doctor in India to do this, who is willing to forgo his fee, and a very kind group of you are helping us to cover the other expensive costs involved. Sivaranjani will have the operation this January - we'll keep you updated on her progress. We partnered with Indian organisation, Orora Global, to install 18 solar lights for use in the Londor community. These lamps replace unsafe kerosene lamps and open flames, making homes safer for families. Londor residents can now keep sight of snakes and other dangerous animals which could enter their homes at night. This year My Name is Kumar has worked with 4 families in the Londor community to stop their young daughters being pushed into marriage for the sake of a dowry - so that they may stay in school and continue their education. The girls themselves have an important role in these talks, asking their parents not to force them into something they don't want to do. Bhavani was one of those girls and we wrote a blog about the issue back in March. Just before Christmas we received a generous donation from an Indian supporter - marking a major step forward in ensuring our partner organisation CARE Foundation can become independent by 2023. The money was used to buy new clothes for all the children we care for as a Christmas present. All the children wore their new outfits to their Christmas party. In 2016 we laid out our 'Theory of Change' – a special document meant to help non-profit organisations map their short term, long term and final outcomes. We use our Theory of Change to give strategy and clarity to the way we spend donations and where we focus our resources. In 2016 seven babies were born into the Londor community – all babies and mothers are doing great. My Name is Kumar and social workers from CARE Foundation make sure that all new borns receive the correct vaccinations and are equipped with a birth certificate so as to avoid a difficult process in the future. Read again why having a birth certificate is so important. Throughout 2016 we have been lucky enough to work with many other people and organisations who share our ambition of ending poverty within the Londor community, offering alternative incomes to begging and providing a top quality education to the Londor children. A special thank you to Rabobank Share4More, Global Giving UK, TripAdvisor and Deloitte for their support this year. We also wrote a number of blogs this year to give you more of an insight into life within the Londor community and the work we do. You can look back at our three favourites below. A story about Selvi, whose marriage at 14 and subsequent pregnancy taught our organisation an important lesson which changed the way we work. A story of three sisters (Anjali, Kavitha and Aruna) and their mother Gengamma, who came to work with us after years struggling with alcohol addiction. A story about Nandhini, who was born deaf and later suffered injuries and poor treatment which has drastically affected the way she lives her life.